Lisle Savings Bank was originally chartered on July 19, 1917 as Sacramento Avenue Building and Loan Association. Our doors were opened at 2307 S. Sacramento Avenue in Chicago, Illinois. In that charter, our founding fathers opened the building and loan with the “object of building and improving of homesteads and the accumulation of funds to loan among its members only.” The minimum amount loaned could not be less than $25 and could not be in excess of 75% of the value of the property. After several moves within the city and a name change, on July 2, 1952, we became Sacramento Savings and Loan Association and relocated to 2644 W. Cermak Road in Chicago. 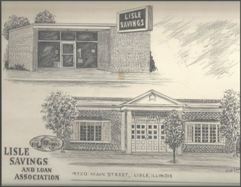 Seven years later, we moved to 4722 Main Street in Lisle and became Lisle Savings and Loan Association. 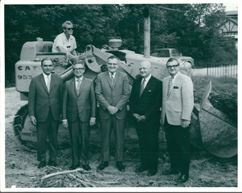 Since 1917, four generations of the Renn family have carried out the spirit of our founding fathers’ wishes to serve and improve their neighborhood. Our commitment to serving Lisle and our surrounding communities has been unwavering not only in terms of serving the financial needs of our customers, but also our belief in the importance of being a great corporate neighbor. We actively participate in many local events and donate money to many important causes. Our financial products and services are competitively priced. We know our customers appreciate our track record of reinvesting in our bank facilities and keeping current with technology to satisfy their changing financial needs. Over the years, many financial institutions have merged into larger, less personal banks. Our employees are local residents who have been with us for many years and are familiar faces in our community. 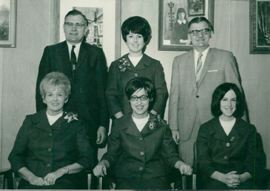 So while many banks have come and gone, four generations of Renns have successfully fostered Relationships For Generations.